Is Alaska the Canary in the Coming Ice Age? “That may not be news to Alaskans coping with the coldest winter in two decades or to the mariners locked out of the Bering Sea this spring by record ice growth, says author Alex DeMarban. In the first decade since 2000, the 49th state cooled 2.4 degrees Fahrenheit. The cooling is widespread — holding true for 19 of the 20 National Weather Service stations sprinkled from one corner of Alaska to the other, the paper notes. It’s most significant in Western Alaska, where King Salmon on the Alaska Peninsula saw temperatures drop most sharply, a significant 4.5 degrees for the decade, the report says. “Most noticeable was that for the first time last year, the Bering Sea ice shelf extended south nearly to the edge of the Alaska Peninsula,” said Don Hatten, the National Weather Service forecaster in King Salmon. No mention of the Sun and the declining number of spots. It has aways been the sun! I am more inclined to believe Russian scientist who do not have to depend on AGW grants to feed their children, rather than the usual team of rent seeking climate scientist that make up the AGW Cult. “Most people do NOT realize how short the Canadian growing season is and that the development of new early ripening wheat was a major discovery for Canadian agriculture, says reader Greg. “The snow is slowly melting in the Canadian Prairie, near Saskatoon, Saskatchewan. and planting is nearly a month behind already. Ever shortening seasons will wipe out Canadian wheat farming. Moods were glum throughout Western Canada that spring. April showers were supposed to bring May flowers. 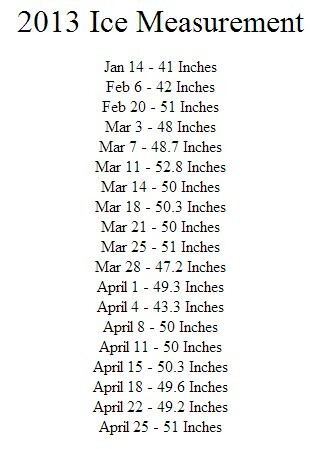 Instead, all the precipitation would come as the “white stuff.” Regina kept reporting another centimetre every few days. Roofs started collapsing. Brendenbury lost the roof of its rink. Still, these things can happen any given year. But by the May long weekend, people really began to worry. There was still snow on the ground. No farmer could plant a crop. Half-million dollar tractor-and-air seeder combinations sat idle…. While that was hard on the pocketbooks, it was worse for the stomach. By July, three-year-old bales that were used for wind protection were fetching $200 a piece, if you could find them. By September, the beef herd had been culled by 75 per cent. There was no food, anywhere, to feed the cattle. After a brief time when stores couldn’t give away all the recently slaughtered beef, and pork, North America suddenly found itself on a vegan diet, deprived of most of its milk, too. After all, you couldn’t drink milk if you couldn’t feed the cows. World grain prices quadrupled over four months with the realization that there would be no grain production from the Canadian West, and substantially less from the American plains. Natural gas prices also shot up, well beyond their 2007 peaks. With people running their furnaces year round, stockpiles dried up and, by fall, drilling resumed in earnest. You can read the rest of Brian’s scary ice age scenario HERE. Looking for another record to be broken. If we see it broken five years in a row, we might want to start worrying if the next minimum has arrived. The ice at Nenana, Alaska is over four feet thick , and getting thicker. Normally it breaks up this week, and the latest it has ever broken up is two weeks from now. Scientists say Alaska is like a canary in a coal mine, foreshadowing the types of changes we can expect for the rest of the world. Some times it is important to stop and take look at the long view to put climate change in perspective. 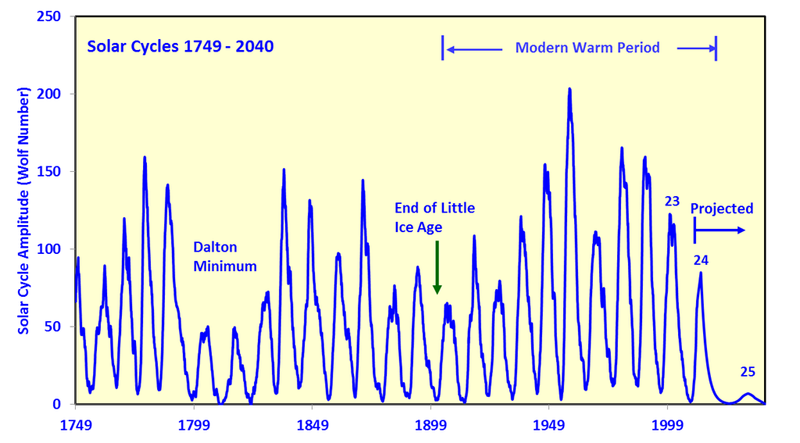 It appears we are entering the little ice age weather patterns of the past. 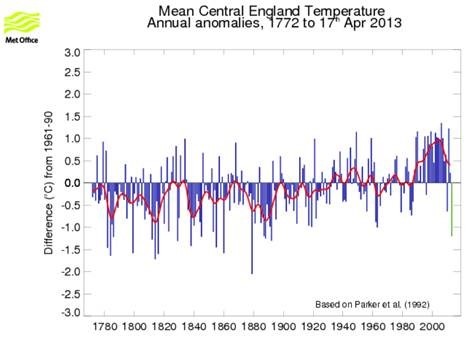 The UK Met Office long term Central England Temperature record has kept a continuous and consistent data set since the 1660s. It appears to be reliable and to have maintained its quality. It has not been adjusted as have so many other official temperature records.Although the CET record covers only a small part of the northern hemisphere, it has shown a consistent rise since the end of the little ice age in 1850 at a rate of about +0.45°C / century or about +0.67°C in the last 150 years. This rise accords well with other temperature records. 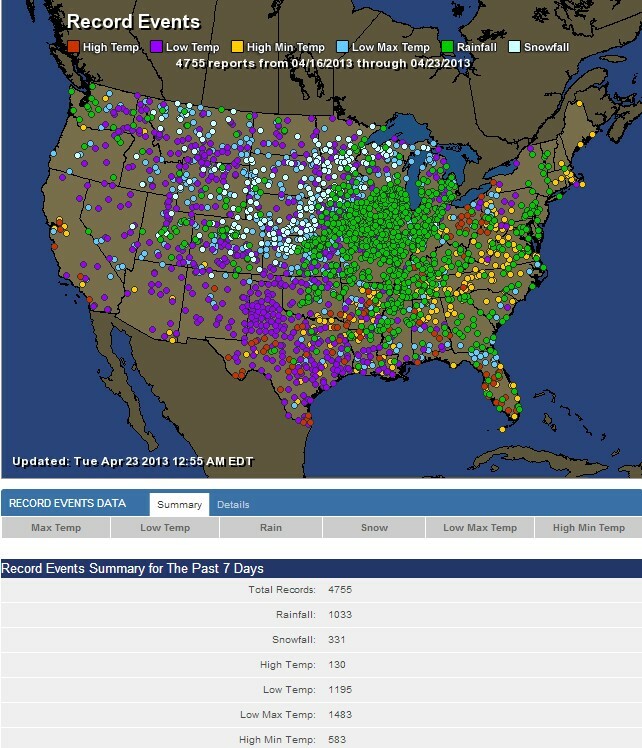 If this were a month of a heatwave across thus USA, like last July, you can bet it would be MSM headlines all over the place and breathless stories from AP’s Seth Borenstein and pronouncements from the Mannian climate cartel about how all this is connected to global warming, er climate change, er climate disruption. 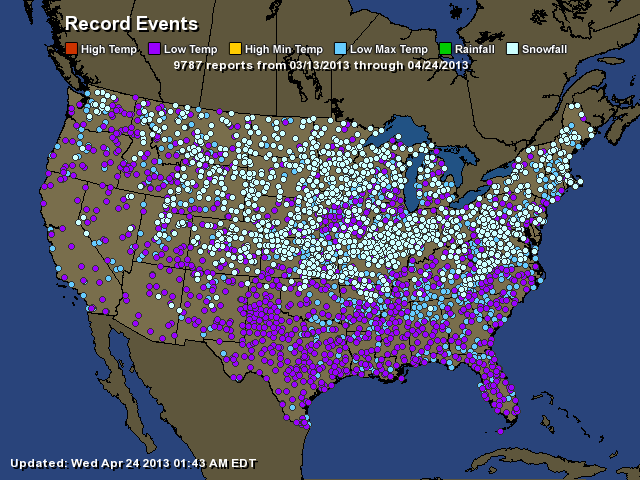 But nary a peep so far about this cold wave lasting over a month that has generated 9787 records posted by NOAA/NWS. Conversely, here is the list of high temperatures, and high minimum temperatures. For some reason, alarmists are no longer interested in this statistic. “A wet, cool spring is delaying planting on the Canadian prairie, but farmers and others generally say they aren’t terribly concerned yet,” says this article in Ag Week. “We’re a week or 10 days behind normal,” says Mike Jubinville, president of Winnipeg, Manitoba-based Pro Canada Farmer, noting that some areas received double their normal snowfall this year. In a normal year, William Nicholson, who farms near Shoal Lake, Manitoba, is planting by May 1. This year, because of heavy, slow-to-melt snow, he doesn’t expect to be planting until mid- or late May. “Everybody would love to have it melted already,” says James Loewen, grain manager with Bunge Canada in Altona, Manitoba. This is weather. However, if it starts happening year over year it will be climate change. A struggling U.S. winter wheat crop suffered what could be a serious blow last week when temperatures dropped below freezing for long stretches twice in 48 hours in large portions of the southern plains. “There’s a pretty widespread area where plants look really bad right now because of that freeze event,” said Justin Gilpin, chief executive officer of the Kansas Wheat Commission. The damage is most severe in places like western Kansas where the crop was already stressed due to a prolonged winter drought. Gilpin said crops were frozen in Kansas, eastern Colorado, Oklahoma and the Texas panhandle by temperatures that dropped below -7 C in some areas. “Certainly we lost some wheat and lost bushels,” he said. Although it is early to be attaching a number to the combined drought and freeze damage, Gilpin wouldn’t be surprised if the U.S. hard red winter wheat crop ends up 25 percent smaller than last year’s 27.3 million tonne harvest. The true level of damage will not be known, until it warms up. This is just weather, it become climate if it happens year after year. This is just an April frost, it will be of real concern if is comes in June. Stay Tuned.